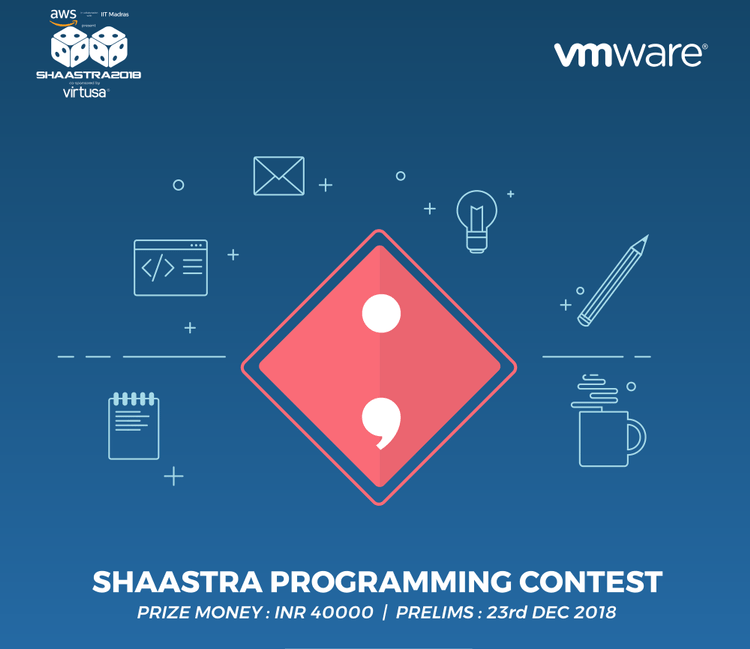 Organiser: The contest is hosted by Shaastra 2018 the annual technical festival of IIT Madras. Sponsor: SPC 2018 is being sponsored by VMware! Prelims prizes: Each member of the top 3 teams in the preliminary round will receive 250 codechef laddus and top forty interested teams will also get selected to participate in the finals. Finals prizes: Goodies worth Rs 40,000 would be distributed to the top teams in the onsite finals. Also register on Finals Registration Link if you want to be considered for selection to the on-site finals which will be held at Indian Institute of Technology Madras. Please contact opc@shaastra.org for any queries during the contest. The contest will be extended by 30 mins in order to encourage more people to solve OPC02 and OPC03. Sorry for the inconvenience in OPC03 the answer for the second sample case is 8 and not 0.